We’re using several layers of insulation on the van walls and floor. Different products have different insulating properties – either heat or sound insulation – and so we need to use a bit of a sandwich. The main heat insulation is Thinsulate – pretty much the same stuff as in gloves and coats, but 1-1/2″ thick and specially designed for use in vehicles. It stops noise as well as heat loss. We got this through Hein, another person who has converted a Sprinter van. He couldn’t find a supplier who would sell to him, so he became a supplier and now he sells it to other DIY-ers! He also sells it on Amazon. 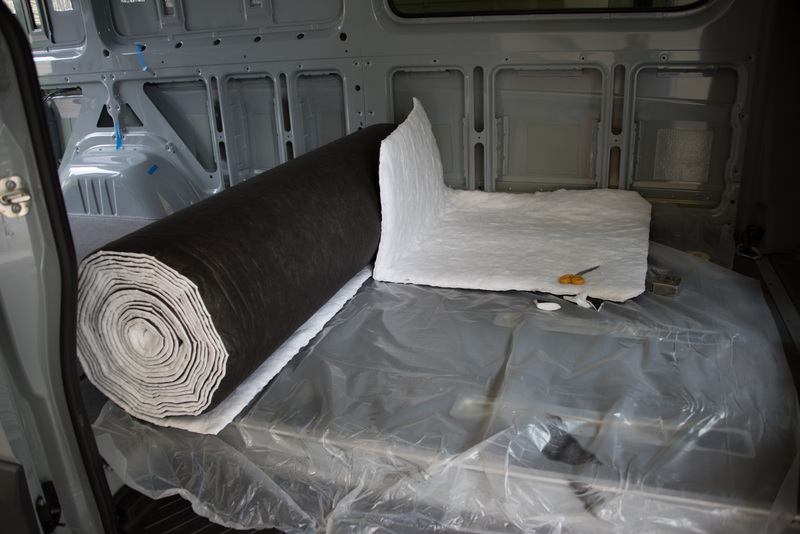 Although Thinsulate is pretty good at stopping the van panels (walls, ceiling) from rattling if it’s glued on properly, there are other products that are better at this. We used Reckhorn, which has a butyl based layer to dampen vibration, with a foil layer on top to reflect heat. It only needs around 25% coverage in order to effectively stop rumble noise. There are lots of other products like it out there (Fatmat, Dynamat) but Reckhorn is cheaper and we think it’s as good if not better quality. We also used Low-E reflective foam for combined heat and noise insulation. It can be used under floors to absorb noise, but when you install it with an air gap, it works to reflect heat back because of its foil layer and closed-cell foam insulating layer. In most places we placed it over the Thinsulate, toward the inside of the van, but in the cab area under the headliner it made more sense to glue the Low-E on first. Reflectix is a better known version of this type of material, but because its middle layer is more like bubble wrap, it doesn’t cut so well, compresses when you stand on it, doesn’t have the same sound insulation properties, and squeaks while you drive. Low-E was a much better option for us. We even tried to get Thinsulate into the thin gaps inside the ribs and at the sides of the windows. It’s debatable whether the insulation will outweigh the straight conductive heat transfer of the metal, but we had some thin leftover pieces that we could use. I pulled them through using a wire fish – normally used for pulling wires through walls, here it did a great job of getting the insulation where we wanted it. Update: Since writing this post, we’ve put together a comparison of all the different types of heat and noise insulation materials that we considered when we chose Thinsulate and Low-E. It covers the relative R-values, costs, and pros and cons of each insulation type. Did you remove the factory flooring to expose the metal underside of the floor before laying down any of this material? If so, in what order did you insulate/dampen the floor? I’m looking to put some snap-in laminate flooring, but would like to sound dampen and insulate it adequately before hand. Would you put the reckhorn down on the floor/wheel wells first? Full coverage on wheel wells and 25% the rest of the floor? Then lay down thinsulate over that followed by Low-E reflective foam? Or am I not understanding this properly. As a newcomver to the conversion process, this is a bit confusing and I’d like to get it right the first time 🙂 Thanks for your help! Julian, we stripped all the flooring out and gave the metal floor of the van a coat of POR15 rust preventative paint (here’s an Amazon link). We did not use Reckhorn on the floor, just on the wheel wells. There’s really no point on the floor. It’ll just add weight for no appreciable sound dampening benefit. Some people use it all over their vans, but the floor is going to have much better sound deadening layers over the top of it than the Reckhorn anyway. Do NOT put Thinsulate down on the floor. Thinsulate works because it has “loft” – space for air to get trapped between its fibers. If you put it on the floor, it’s going to get compressed. Then it won’t have any insulating properties at all. It’s awesome on the roof and walls. Don’t use it for the floor. Thank you for all the info !! It is most helpful. How does the the low e value stick to the thinsulate ? Or did you cover it and taped it ? And what does it add extra ? Sorry just digging into it all and getting overwhelmed ! The low-E is taped on to the metal around each cavity, so it never has to stick to the Thinsulate. In fact, if it did stick to the Thinsulate it wouldn’t work as well because it relies on an air gap to give it good insulating properties. So just lay it over the internal metal frames, and stick it up with the foil tape they provide in the kits. Wow, I just want to congratulate you both on what must have been at first an exceptionally daunting job. 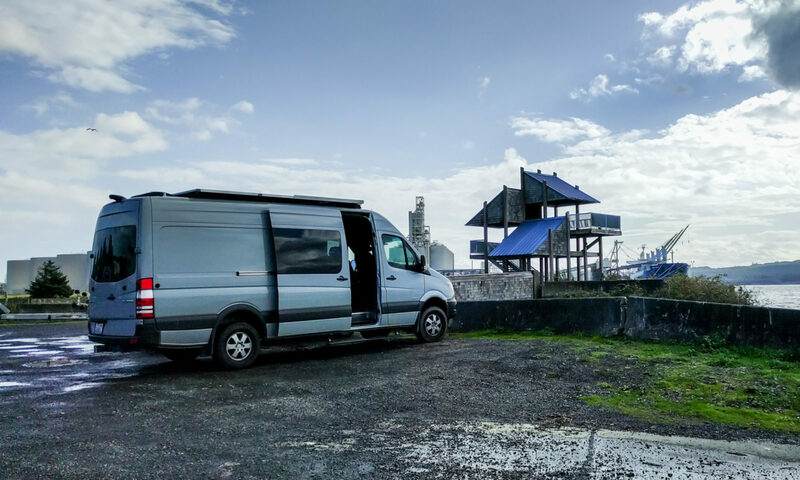 I recently bought (finally, back to some van life..) a 2016 144 sprinter low roof 4×4 with the hopeful intentions of building an interior and basic life support stuff, and have thoroughly enjoyed both reading of your trials and, more importantly, the way you were able to inject links everywhere to products used and other related stages of the build. Paul, thanks for the kind comments. How much Thinsulate was needed? Can you provide what the total cost was for all products used and what they were individually? Mark, for a 170 wheelbase crew van I ended up using 60 feet of Thinsulate. That includes the wheel wells, under the front seat bases, on the firewall below the dash, and a couple of other optional areas. If you contact Hein, he knows pretty much how much Thinsulate each van type needs. I don’t have easy access to the material costs, and the costs may have changed since I insulated my van, but it’s pretty easy to work out how much the Low-E, extra tape, and 3M 90 adhesive will cost just by visiting Amazon. If I recall, we bought around 6 cans of 3M 90 adhesive and 100′ of 48″ wide Low-E. We used around 10 sq.Ft of Reckhorn sound insulation but I might be tempted to use less than that if I was doing this in the future. First of all, thanks for creating an enormously helpful, well-written and nicely photographed site!! I can’t tell you how much time I’ve spent poring over your articulate descriptions of how you did your conversion and why you did the things the way you did them – understanding the ‘why’ is hugely helpful. 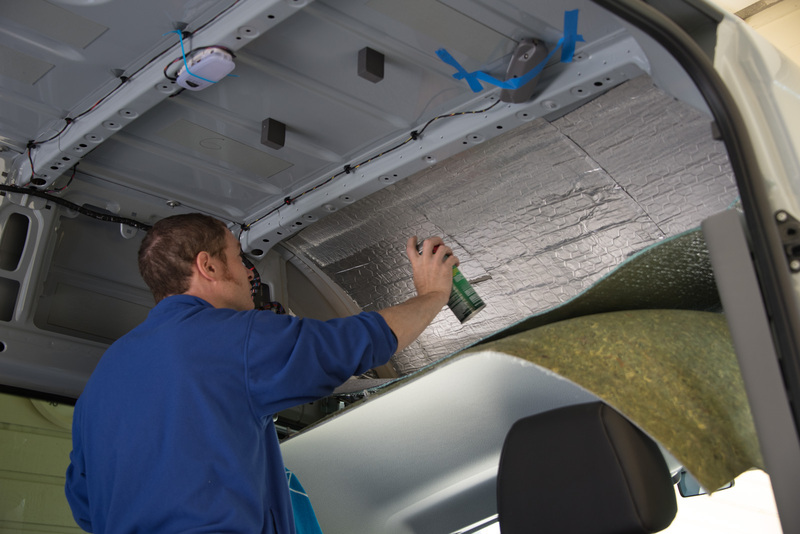 So – here’s my question (for today…): we insulated using Thinsulate from Hein, glued to the skin of the van using 3M 90 adhesive. Great material to work with and we have been really diligent to fill the ceiling ribs, side beams, etc. Then we covered the openings with Reflectix – filled between the ceiling ribs, sidewall openings, etc. The Reflectix is taped in place using the Reflectix tape (aluminum tape with a VERY aggressive adhesive with a backing strip that you have to remove, which is a major PITA. We did not tape 100% – the Reflectix is held in place with pieces of tape and the overall coverage is probably 60%. Should there be 100% coverage of tape along the Reflectix seams, so that it is completely ‘sealed’ to the structure? It seems like there is opportunity for air transfer in places anyway, so trying to create a 100% barrier between the interior of the van and the space between the Reflectix and the Thinsulate would be futile anyway, but I’m worried that I’m missing something because all of the other Sprinters I’ve seen where people used the method we used seem to be fully taped, like yours appears to be. It doesn’t look as if you used the Reflectix tape that’s such a pain to work with – what did you use and how did you like it? Pete, glad you like the site! There is, as with every aspect of van conversion, some discussion about how well to seal the Reflectix layer. Some people like to try and create a moisture barrier, but there’s a couple of issues with this approach. First, it’s very hard to create that barrier when you have to run wires, cut holes for outlets, and otherwise puncture the Reflectix. Like you mentioned, even making sure you taped everything is an issue. 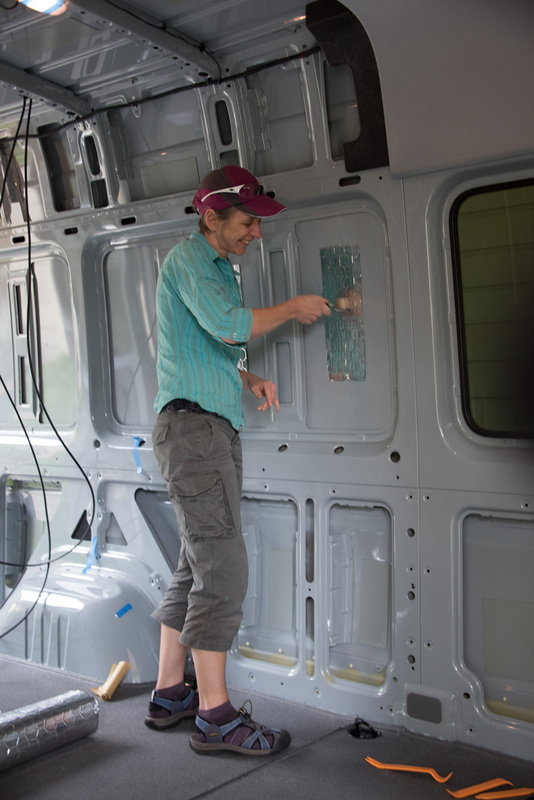 Second, the metal outer wall of the van is a pretty effective moisture barrier and generally you don’t want both skins of your wall to be barriers, because moisture has to move in and out somehow. We ended up not sweating the taping job and not worrying about smaller holes around outlets, etc. We don’t want to create an impermeable moisture barrier. Instead, we’re looking to reflect back whatever heat makes it through the Thinsulate layer. We used the tape that came with our Low-E foil-faced foam, then when we needed to buy more we got some aluminum foil tape like this stuff. All the foil tapes I’ve seen come with a backing layer because the adhesive is too strong to make it as a non-backed roll. It’s a pain to peel each piece off, but you might find it helps to fold over a tiny piece of the corner so that the backing separates from the foil layer. Then you can tease them apart. We also started peeling the backing before we cut the length we needed, and peeling slightly past our cut point so that the backing was separated from the foil on the remaining roll. That’s more of a 2-person job though. In terms of the paper-backed aluminum foil tape, that was the method that eventually emerged: one person cuts the tape and hands pieces to the other, who sticks the Reflectix in place! We’re on the same page vis a vis the need for a continuous vapor barrier on the inside of the Thinsulate – it seems both impractical and unnecessary. Thanks for that bit of validation – nice to know that I’m on the right track! I found a product at Home Depot that is a great deal easier to use than the Reflectix aluminum foil tape and seems like it would be job-rated for taping the Reflectix/Low-E insulation. It’s Nashua 555 HVAC Flex-Fix. Foil tape, but no paper backing like the aluminum tape (which seemed like overkill to me) and it’s about $12/roll for a 150 yard roll, which seems like it would be enough to do a whole Sprinter. Oh – it’s in the HVAC section with the duct tapes. Thanks Pete – good to know about this tape. Although Nashua is a relatively generic brand, I’ve always been happy with their products. Looking at the details on Amazon, it’s hand-tearable, metallized mylar construction, and suitable for high-temperature situations. Reviews seem positive too. 120 yards is ~360 feet, so plenty for a van! Did you install all of the rivnuts prior to insulating, then pre-fit the panels, then insulate/reflectex? What did you do with the stock wiring that runs along the DriverSide roof line? How did you attach the upper cabinets to the ceiling above the window, and did you pre-fit this prior to insulating/reflectex? Again, thanks for the site!!!! Tim, in my case, I installed the Thinsulate, then placed Rivnuts in factory holes where possible and drilled for them where they were needed. It’s a good idea to be able to check behind the Rivnut locations prior to drilling, and if you have put the Reflectix in and taped it, it’s a lot harder to do that. I added some runs of wire to that factory bundle along the drivers side roof – it’s all concealed with my overhead compartments along the back and a small soffit in the front. It’s easier to add the Reflectix last (after you have cut your electrical outlets and switches into the panels and run the wiring) because you can bring the wiring out and then tape around it. Tim, we installed most of our rivnuts prior to insulating. It’s easier that way. Drilling holes in the metal when there’s Thinsulate behind is asking for trouble, because it catches in the drill bit. Also, there’s more chance of stray metal chips getting caught in the insulation rather than being vacuumed up. Obviously we didn’t plan ahead for everything and there were a couple of rivnuts that we installed later. It’s important to make sure there is nothing interfering with a good bond between the rivnut and the metal. For instance, aluminum tape (used to stick the Low-E foil faced insulation in place) needs to be peeled back before you put the rivnut in place. You also need to make sure there’s no way for the in-wall insulation (Thinsulate in our case) to get caught in the rivnut as it compresses. Drilling out a spinning rivnut is no fun. We left the stock wiring in place along the driver’s side, but we placed it in a wire race along with some other wires of our own. We covered that with our ceiling coving that houses some of our lights. We don’t have cabinets above the window (yet). When we do put them up, we’ll run a bolt through the existing holes in the ceiling beams and drop a bracket down from that to hold the cabinetry in place. The upfitter’s guide shows a variation on that method for installing shelving in a work van.